It’s that time! Time to figure out evaluate our weekly market review the 2016 Performance Review for the Invest Safely Stock Market Outlook. Safe investing is one path to wealth, based on aggressively protecting your capital from losses. In 2015, the market outlook accomplished exactly that; following the signals led to profits, while returns from the general markets were flat or even negative. Digging into the results, I found some price slippage; the price movement during the time between a signal and the trade. Ideally, you’d try to make this as small as possible. The good news? All the price slippage is generated by me when I simulate trades based on the market outlook. In other words, the weekly signals are good. It’s the after-the-fact calculations that are the problem. Adjusting the trading criteria (i.e. the price I use to calculate entry and exit positions) made the results much better. Not great, but acceptable given the black swan events we witnessed last year (Brexit and the US election). Going back to 2015, the outlook outperforms buy and hold, and we still haven’t witnessed a bear market. Overall, I’d say that looks like success. I may also be able to improve the accuracy of signal’s generated, but that’s a research topic for a different day. By showing an example evaluation, I’m giving you an example of the safe investing processes in action. The objective here is not to be right or wrong. Instead, it’s to improve performance. Plan, do, check, act: the simple, four step management process popularized by Edward Deming. After another year of doing, it’s time to check the outcomes, see just how well (or poorly) the weekly “Stock Market Outlook” performed in 2016, and act on anything that can be improved. The results aren’t great. I actually ran the numbers twice because I figured I made an error in Excel. Needless to say, it’s time for some analysis. I started by overlaying the market outlook on the S&P500: red for downtrends, yellow for mixed conditions, and green for uptrends. Next, I marked the entry and exit points (market closing prices): green circles for entry and red circles for exits. In total, slippage reduced returns by ~5%! And that’s about the same amount the outlook underperformed the S&P500 index. Of course, the price slippage was never entirely real; probably more like a worst case. You and I would have placed an order as soon as possible after reading the Sunday update (i.e. most likely the Monday morning). Conclusion? The way that I simulated real-world results wasn’t very real-world, and making an adjustment is worthwhile. The market outlook posts on Sunday, based on the prior week’s market activity. Because I used a weekly timeframe for the results, I can either choose the weekly opening price or the closing price. For simulation purposes, I chose the Friday closing price AFTER a signal change as the “buy price”. This meant that all of that week’s price action (good or bad) was not showing up in my simulated results. I still see significant differences for the NASDAQ and the Russell 2000, but am not too surprised. My signals are based on the S&P500, and it’s possible for other indexes to lead and lag at any given point in time. I also checked price slippage over the weekend (from Friday’s close to Monday’s open). During 2016, the highest price change between a Friday close and a Monday open was 0.7%, the lowest was -0.4%. The mean and the median were both 0%. In summary, it’s pretty obvious that using closing prices the week following a signal change dramatically impacted investing performance. The issue is one you’ll experience any time you try to back-test your system; prices will never be 100% correct. Remember: All models are wrong, but some are useful. 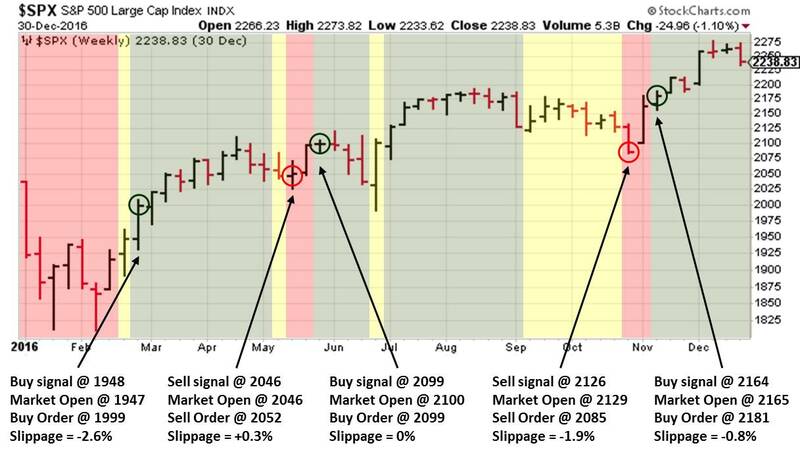 The forward looking outlook (uptrend, downtrend, mixed) is posted on Sunday, based on stock market price action from the prior week. Since that week is already in the books, there is no way for you to “trade” at the same prices that shaped the outlook. As discussed earlier, the “price” used for calculating performance is now the market open price the week following a signal change. I’m assuming that trades are placed in an account with Fidelity, so transactions cost $7.95 per trade. Everyone should be using a low cost broker, and there are several with lower costs than Fidelity…FYI. Reason 1 remains valid, but is also true for all timeframes, making the concept difficult to simulate. Timing is one of the reasons that individual results WILL vary. Reason 2 was based on price movements before a market opens (i.e. gap moves). This is a phenomenon is more likely to affect individual stocks (particularly those with lower trading volumes) than a market average. The average, by its very nature, will reduce the impact of these moves. During 2016, the max price change between a Friday close and a Monday open was 0.7%, the minimum was -0.4%. The mean and the median were both 0%. Are you always going to buy an uptrend, sit on your hands when the market is “mixed”, or sell exactly when a downtrend takes hold? No. General trends are great for giving you a sense of the overall investing environment. But each of your positions needs to be evaluated on its own merits. Past performance may not be indicative of future results. Therefore, no one should assume that future performance will be profitable, or equal to any corresponding historical index. For example, the S&P 500 Composite Total Return Index (the “S&P”) is a market capitalization-weighted index of 500 widely held stocks often used as a proxy for the stock market. Standard & Poor’s chooses the member companies for the S&P based on market size, liquidity, and industry group representation. Included are the common stocks of industrial, financial, utility, and transportation companies. The S&P is not an index into which an investor can directly invest. The historical S&P performance results (and those of all other indices) are provided exclusively for comparison purposes only, so as to provide general comparative information to assist an individual in determining whether the performance of a specific portfolio or model meets, or continues to meet investment objective(s). 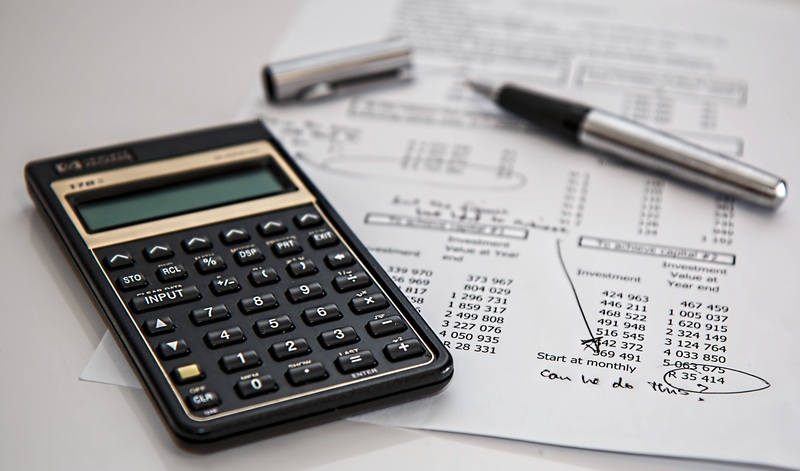 The model and indices performance results do not reflect the impact of taxes. This entry was posted in Historical Data, Investing, Market Trends and tagged elliott wave theory, investing process, price slippage, safe investing, technical analysis techniques, US Stock market. Bookmark the permalink.